We cover all areas to help students get trained for Campus Interview. We have a huge number of questions under various topics like Logical, Aptitude and Technical. Also included are Question papers from different companies. Question papers are added continually under each topic by a team of dedicated staff. 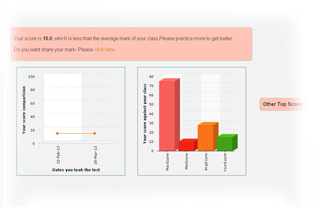 We also provide an intuitive and interesting way of showing scores in a graphical format to your student. 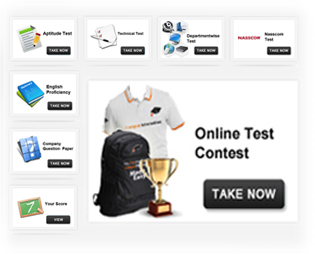 We have also integrated our portal with other Online Test providers and we will continue to integrate with more companies so your students will get best out of it and is exceptionally well trained. 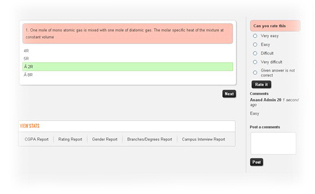 Along with result, the student is also shown where they stand in the college. They are shown an intuitive graph with their mark, college average performance and the highest score. This will help them realise how much work they need to put in to close the gaps in their performance. They will also be able to view individual scores of fellow batch mates. We have also introduced a method for them to challenge their batch mates to make learning more fun! We also provide several avenues for the Placement Cell and Management to see how the students are fairing in various tests. By the click of a button, they can see how students have done in a particular test or they can see how the entire class is doing. 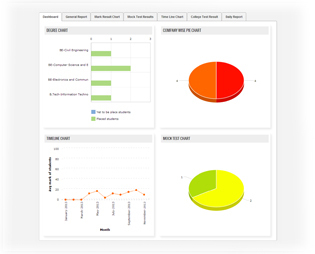 We also have charts with which you can see how students are performing department wise and subject wise. Placement cell can also see the students who are actively participating and who are not participating in the test.